Wednesday, 21 November, 2018, on the Feast of the Holy Archangels Michael and Gabriel, Metropolitan Vladimir of Chisinau and Moldova made arch-pastoral visit to the Diocese of Cahul and Comrat, to conduct the Divine Service on the Patron’s Feast in Cahul diocesan Cathedral. The spiritual citadel in the heart of Cahul, built in 1850 on the place of an older wooden church, celebrated the feast of its heavenly protectors. 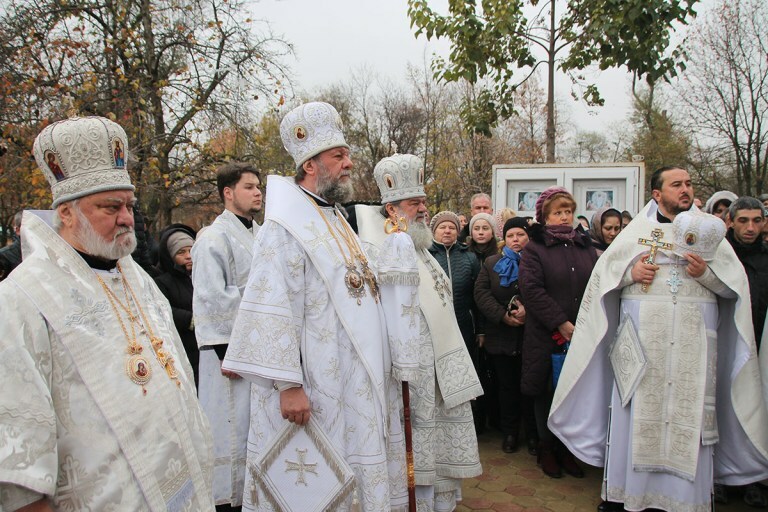 Metropolitan Vladimir celebrated the Divine Liturgy, concelebrated by diocesan hierarch, Bishop Anatolie of Cahul and Comrat, and Bishop Nicodim of Edinet and Briceni, and assisted by numerous priests and deacons. Numerous parishioners arrived to participate in the Divine Service on their community’s Patron Feast. Present at the celebrations were state officials, members of Parliament, and representatives of local public authorities. The metropolitan congratulated the liturgical community and all inhabitants of Cahul town on their Patron Feast, wishing them to follow the example and deeds of predecessors who were united in faith around Christ, regardless of their ethnicity. A cross procession followed after the Divine Liturgy, with prayers and Gospel Readings.